What is the principal softwood used for lumber in Massachusetts? On what continent are maples most abundant? What is a liquid product of wood that is used in mixing paints? * At the 39th National 4-H Forestry Invitational, a team of four local high school students went head to head with teams from across the country to answer these questions and more. 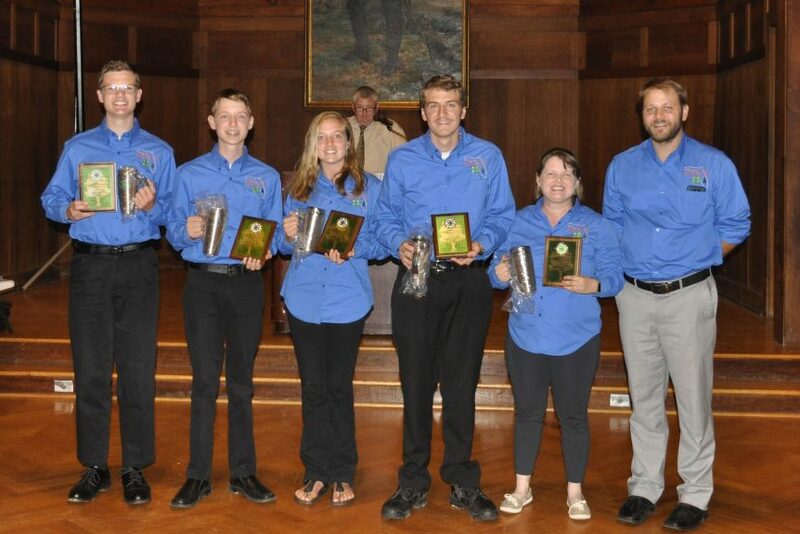 The University of Florida Institute of Food and Agricultural Sciences Extension Alachua County 4-H Forest Ecology team advanced to Invitationals after winning first place at the statewide Florida 4-H Forest Ecology Contest presented by the UF/IFAS School of Forest Resources & Conservation. Florida 4-H is the youth development program of UF/IFAS Extension. At Invitationals, held this year at West Virginia University, 4-H members from across the country compete for overall team and individual awards in several categories. Events include tree identification, tree measurement, compass and pacing, insect and disease identification, topographic map use, forest evaluation, the forestry bowl and a written forestry exam. The team, which included Taylor Dykes, Will Eubanks, Anna Hooks and Jonathan Vonesh, was thrilled to take home the third-place prize. “Competing at 4-H Nationals for forestry was the highlight of my 4-H career. It was amazing,” said Will, 15. This particular team has competed together for several years. Jonathan, 17, who won third place individual at the Invitational, says he has formed lifelong friendships through the program. “Being a part of the forest ecology team has taught me how to work on a team with those who may have different views than I do and has helped me grow some of my strongest friendships,” he said. Anna, 16, joined the team in 2011 and gained a newfound appreciation for the natural world. “Learning how different elements of a forest interact has inspired me to work towards a career in ecology, with a focus on the human impact of our environment,” she said. Per 4-H rules, teams can only compete at the national level once. The current team will now focus on coaching younger members of the forestry team for next year’s competition. The students all plan to pursue degrees in environmental sciences or natural resources in the future. Florida – 3rd place overall, 1st place quiz bowl team; Jonathan Vonesh – 3rd place individual; Taylor Dykes – 13th place individual; Anna Hooks – 14th place individual; Will Eubanks – 21st place individual. *Answers, for curious minds: White pine, Asia, turpentine.